Owing to what it described as blatant misuse of official machinery and muscle men by the ruling SAD, the Congress today decided to boycott the Zila Parishad and Block Samiti elections in entire Faridkot district. Nine candidates have filed their nomination papers for the byelection to the Amritsar (South) constituency to be held on May 22. Today was the last day of the filing of nomination papers. 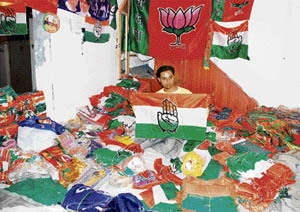 The ruling SAD has fielded Inderbeer Singh Bularia, the son of late MLA Raminder Singh Bularia who demise necessitated the bypoll, while the main opposition Congress has fielded a new face in Navdeep Singh Goldy. Perturbed at the increasing influx of Bangladeshis into Punjab, the state Intelligence agencies have called for conducting a survey to detect the presence of Harkat-ul-Jihad Islami (HuJi) militants among such migrants in Ludhiana. Ludhiana has been recommended for this survey because it has been revealed that contractors are in league with Bangladeshi nationals and help them in procuring jobs after taking commission. Farmers, exporters of rice and pro-farmer politicians today joined hands to take on the Union government for getting removed the restrictions imposed on the export of basmati rice. Bikram Singh Majithia, information and public relations minister, today sought an apology from president, Punjab Pradesh Congress Committee, Rajinder Kaur Bhattal, for making “irresponsible” statements against Akal Takht. The BJP suffered setback with the withdrawal of nomination papers by a BJP candidate Amandeep Singh from the Mangwal Zila Parishad (ZP) zone of this district today. However, Joginder Singh is now the lone ZP candidate of the BJP in this district, who is in the poll fray from Andana ZP zone. President of the Sikh Educational Society (SES) Gurdev Singh Brar has appointed Col Jasmer Singh Bala (retd) as the secretary of the SES today. 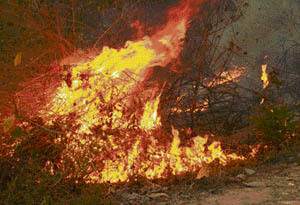 The fire, which had been simmering in forests of scores of villages in the Talwara area for five days, last night spread to Vankaranpur, Bazarpattu, Dhaarpur, Sandpur, Dohar, Bhera, Ram Nangal, Fatehpur, Dohar, Behra and Vehmawa villages. 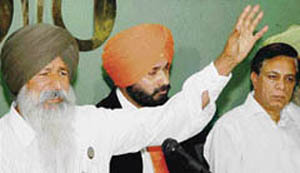 Former Jathedar, Akal Takht , Prof Darshan Singh, has refused to appear before the Sikh clergy of Patna Sahib by the May 10 deadline to explain his position for opposing Dasam Granth. Rejecting the report of the Sixth Pay Commission, the Military Veterans of India, an organisation of ex-servicemen, said today that the commission had done “injustice” to serving and ex-servicemen in its report on several grounds. It asked the Central government to either reconstitute the pay commission or set up a review pay board with members from serving and veteran armed forces personnel to provide justice. Two boys from influential families of Khanna and related to SAD and SGPC members today had a brawl over giving passage on roads of the city. Tempers ran high among Congress workers when a team of Health Department officials raided Bittu Milk Centre in Dhingi village, about 10 km from here. The centre belongs to Balvinder Singh Bittu, who is a Congress candidate for the Zila Parishad elections from Dulladi village, opposite grandson of SAD veteran Raja Narinder Singh. Dalbir Kaur, the indefatigable sister of Sarabjit Singh, Indian prisoner on a death row in Pakistan whose execution was stayed indefinitely by the Pakistani authorities recently, is on a new mission of getting Pakistani prisoners languishing in Indian jails released. Virtually passing strictures against Punjab’s Department of Rural Development and Panchayat for not responding to court notices, the Punjab and Haryana High Court today ruled it was conscious of its powers to deal with “obstinate and arrogant officers”. A Division Bench of the Punjab and Haryana High Court, comprising Justice M.M. Kumar and Justice Sabina, today asked the State of Punjab to reconsider at its own level the orders on withdrawal of security to former minister Sucha Singh Chhotepur. Punjab farmers have never been so hassled by the lack of both manpower and machine during wheat harvesting, as they were this rabi season. In what appears to be a bumper harvest, most harvesting has been done by hand by farming families who feared for their crop on account of the unprecedented fires alternating with unwanted rain. A visit to various mandis in the region has for the first time disclosed that many farm labourers now prefer to stay back in their home state of Bihar, Jharkhand and Uttar Pradesh finding enough work there. 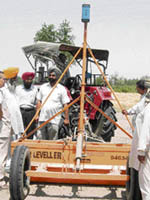 In a state that leads the world in the per acre use of farm machinery, the ‘laser-leveller’ is the Punjab farmers’ latest rage. A high-precision equipment, the leveller is attached to a tractor and is guided by laser beams to level the land after wheat has been harvested. This renders the land plain for better sowing of the rice crop and saves water usage in rice sowing and also reduces electricity consumption.